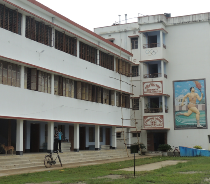 MUGBERIA GANGADHAR MAHAVIDYALAYA was established on 2nd of July, 1964 as a co-education college by a society of the same name in a village in Contai Subdivision of Purba Medinipur District (Erstwhile Midnapore District) after the name of Medinipurs pride - Late Raisaheb Gangadhar Nanda - a great lover of education. The college is situated in a culturally rich locale, and it is the only college in the vast area of Bhagwanpur-II block. It was founded with the help of the donations collected from the local people with the aim to serve the poor inhabitants of the area who were unable to send their wards to distant places for higher education. It is noteworthy that some eminent people, enthusiasts in education and social work, took the initiative in establishing this college. Notable among them are Shri Jyotirmay Nanda, Shri Hrishikesh Gayen, Shri Rammay Nanda, Shri Biswanath Sarangi, Shri Tarapada Maity, Shri Sudhir Kumar Hazra, Shri Rakhal Chandra Sarangi, Shri Nanda Gopal Maity, Shri Bankim Chandra Hazra, Shri Ajit Kumar Paria, Shri Jogesh Chandra Nanda, Shri Jagattaran Tripathy, Shri Sachikanta Nanda, Shri Satish Chandra Manna, Shri Swadesh Gayen, Shri Surendranath Jana, Shri Sitanath Das, Shri Gunadhar Maity and Shri Baneswar Maity. The authorities were mainly dependent on the charity of the people for buying the required land and construction of buildings.The college greatly owes to Mugberia Gangadhar Trust for a donation of Rs. 15,345/-, and to late Shri Sailajacharan Nanda for giving away a house along with land where a suitable hostel has been constructed recently. Pandit Jyotirmay Nanda, B.A, Vedantakabyatirtha, Vidyabhusan was in charge of the college as the secretary for six years from the commencement of the institution. His efficient administration enabled the college to begin its odyssey surmounting colossal difficulties. The college is grateful to the famous psychiatrist Dr. Asit Baran Patra and his wife Prof. Gouri Patra for their donation of Rs. 3 lakhs in memory of Shri Bhimacharan Patra for the construction of the Science Building. Shri Kiranmay Nanda, Honble Minister of the Dept. of Fishery of the State Government who was the President of the College did his best in terms of monetary donations and physical efforts for the development of the college. Moreover, he had taken initative for constructing an auditorium in memory of his father Shri Jyotirmay Nanda. Again, the college had received Rs. 5 lakhs from the Government of Uttar Pradesh under Shri Mulayam Singh Yadav through his endeavour. The boundaries of the campus was constructed with the help of his fund and co-operation of the local people. A magnificent gate was constructed at the entrance of the college with the financial aid from the teaching and non-teaching staff as well as the students of the college. Several beautiful gardens were constructed to enhance the beauty of the premises at the initiative of NSS, NCC and the employees of the library. Dr. Nilabja Nayan Sarangi donated a substantial amount in memory of his mother Late Susama Devi and Smt. Jyotshna Sasmal of Contai town also donated a substantial amount in memory of her husband Late Aurovinda Sasmal. Apart from these major donations many well wishers have contributed towards the development of the college and still continue to do so. The college is grateful to Late Prof. Sudhir Giri, the former M.P., for contributing Rs. 2 lakhs from his MPLAD fund. The former M.P. Shri Prasanta Pradhan had donated Rs. 7.5 Iakhs from his MPLAD fund for the construction of the Four Decade Memorial Building. The Zilla Parishad had given away Rs. 5 lakhs for the building of the B.P.Ed. section. Education Directorate, Government of West Bengal, Fishery Department, Governemnt of West Bengal and Shri Kiranmay Nanda (from BEUP fund) had granted Rs. 25 lakhs, Rs. 16 lakhs and Rs. 18 lakhs respectively for the construction of college buildings and the purchase of laboratory equipments. Education Directorate, Government of West Bengal and Shri Ardendu Maity (froom BEUP fund) granted Rs. 24.6 lakhs and Rs. 3 lakhs respectively for the construction and repair of college buildings. The UGC has contributed in many respects and has granted Rs. 70 lakhs for womens hostel. Bhagwanpur II Panchayet Samiti has arranged for a tubewell in the college campus. Shri Ranajit Mondal, the former President of the college, was instrumental in arranging for a grant of 1.6 lakhs from the Zilla Parishad for developing toilet facilities in the college. 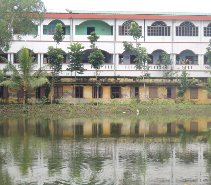 Mugberia Gangadhar High School had permitted the use of their rooms for the first four years and the college remains ever grateful to them. The college has started a diploma course in Tourism and Hotel Management under Community College of UGC from July 2015. For this financial assistance has been given by UGC of Rs. 71.96 Lakhs. The college has been awarded the CPE status from 1st April 2016 to 31st March 2021 from the UGC for enhancing the quality of education in the college.For this UGC has granted Rs. 110 Lakhs.